Many accident victims sustain totally new and unexpected injuries. For instance, a passenger involved in a car accident who had no preexisting injuries or history of bone problems may suffer a broken leg. In other situations, however, an accident may cause an old injury to flare up or aggravate a preexisting condition. Fortunately, injured parties with preexisting conditions can still collect compensation from the person or entity responsible for the accident under a theory known as the eggshell plaintiff rule. Knowing if and when these types of complex legal theories apply can be confusing, so if you were injured in an accident, but had a preexisting condition that caused you to suffer a greater degree of harm than would usually be experienced by the average person, it is critical to retain an experienced personal injury attorney who can defend your interests and help you seek the compensation that you deserve. The eggshell plaintiff rule is a legal theory accepted in some states, including Florida, that holds that a negligent or reckless party can be held accountable for the full extent of the injuries sustained by a plaintiff, even when the degree of harm he or she suffered was more than what would usually be suffered by the average person. Basically, defendants are not permitted to use a victim’s sensitivity or preexisting medical condition as a defense. This doctrine is important because it recognizes that not all injured parties will experience the same accident in the same way and that just because a plaintiff is more likely to suffer from certain injuries than others does not mean that the defendant can escape liability. Instead, defendants are held responsible for any adverse consequences suffered by a plaintiff, regardless of whether they were foreseeable. When Does the Doctrine Apply? An injury hastens a death or disability. In these types of cases, juries who find that a defendant caused an injury and that the injury aggravated a preexisting disease or defect, are directed to attempt to determine which part of the plaintiff’s condition was the result of the aggravation. However, if a jury is unable to make this distinction or finds that the condition would not have existed but for the injury, its members are encouraged to award damages for the entirety of the plaintiff’s injuries. 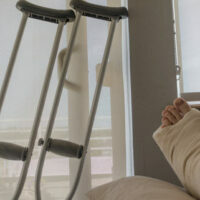 An injured party’s preexisting condition does not excuse a negligent person who caused an accident from liability, so if you suffer from a medical defect or condition and were subsequently injured in an accident that exacerbated those problems, please contact Boone & Davis in Fort Lauderdale by calling 954-566-9919 or by initiating a live chat with a member of our experienced legal team who can evaluate your claim.